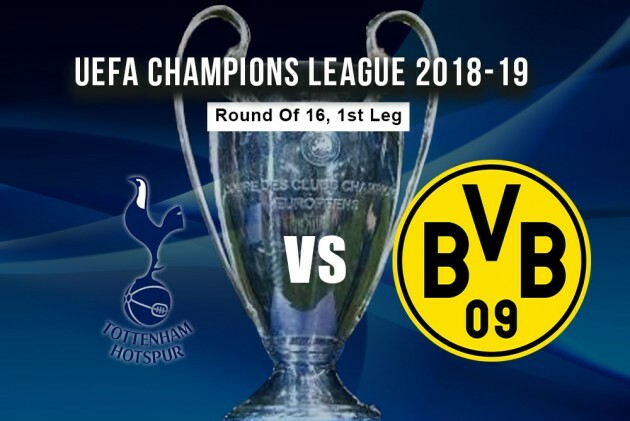 Tottenham Vs Dortmund: When And Where To Watch The Round Of 16, 1st Leg Match? Spurs were knocked out in the same stage of the second-tier Europa League 2015-16 by the Germans but got their revenge last season by winning both the Champions League group stage matches. How To Watch Man Utd Vs PSG Match? In one of the most enthralling Round of 16 clashes of the 2018-19 UEFA Champions League, two brilliant sides but with very limited success will take on each other. For both Tottenham Hotspur and Borussia Dortmund, a win in the first leg is vital considering their tough challenges in the domestic league. In Germany, Dortmund have a five-point lead over defending champions Bayern Munich, but they are now feeling the heat after bad results in their last three outings. In England, Spurs are keeping their league title hopes alive but their recent wins have been scrappy. A good performance in the continental competition will boost their confidence. At third in Premier League, with limited resources, they can afford a tough return leg. Yes, Spurs were knocked out in the same stage of the second-tier Europa League 2015-16 by the Germans but got their revenge last season by winning both the Champions League group stage matches. This is only the third time Spurs have got this far in the tournament, and have progressed from the Round of 16 just once before. But, Dortmund are in the Round of 16 for the fifth time, having progressed in three of their four previous appearances. Prediction: 2-2. Dortmund will have a slight advantage with the hosts missing Harry Kane and Dele Alli, two of their best players. But the presence of free-scoring, creative work-horse in Heung-Min Son will make the encounter an enthralling affair. The same can be said of Raphael Guerreiro, who has scored four Champions League goals for the Germans this season.